Insert Tamia's "Stranger in my House" reference here. Seriously just play the song to get yourself in a good mood or to have a laugh. 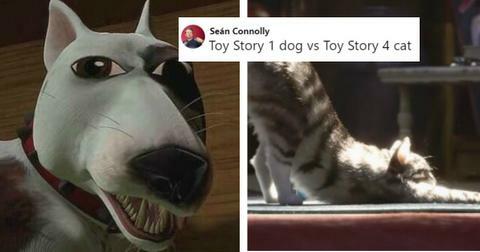 You'll need the humor to get over how creepy this story is. The feeling that you're being watched is one that most people don't want to deal with, unless you're into that sort of thing, that is. Nor is it a great feeling whenever you're home alone or you think there's a stranger in your house all of a sudden. As someone who grew up in a large family whenever there's a bunch of hustling and bustling about, I start getting the heebie-jeebies just at the thought of being alone. 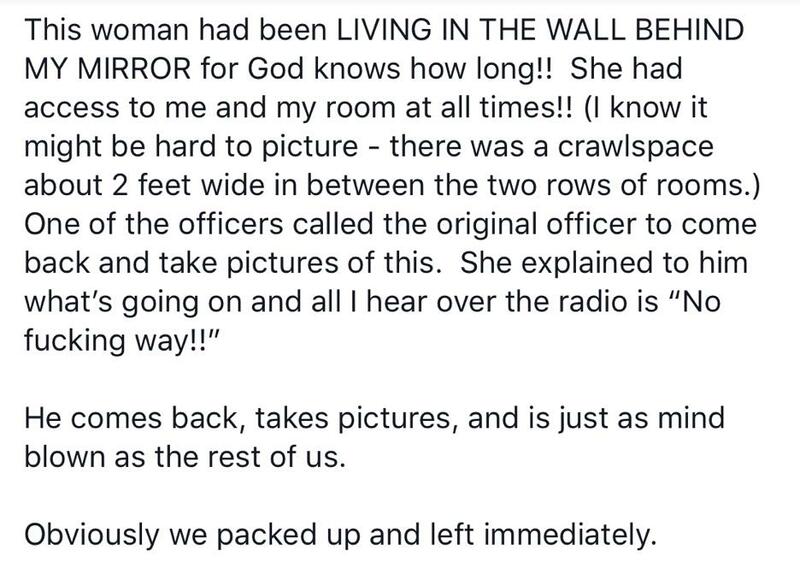 So I can only imagine how I'd feel if I heard something in my home or hotel room and it turned out there was a person actually there. 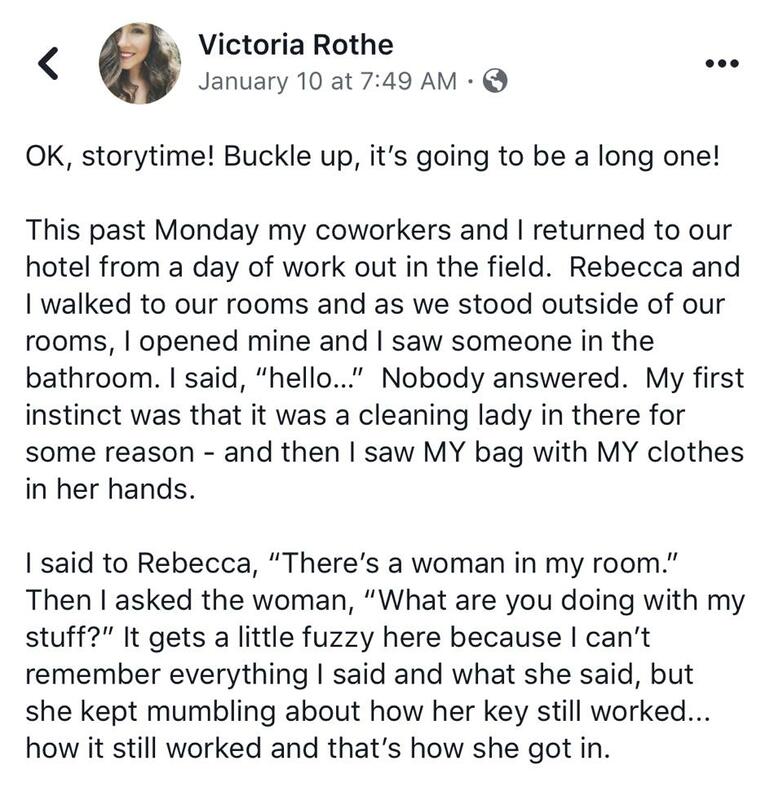 Horrifyingly, that exact same thing happened to Victoria Rothe, who was walking to her hotel room with a co-worker. 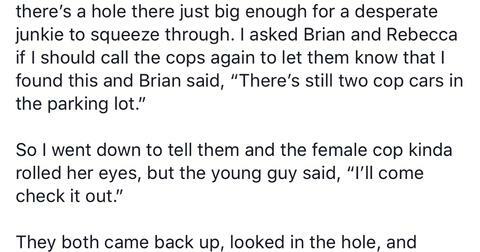 After opening the door, she was shocked to see a woman standing inside carrying a bunch of bags. Processing what was going on, she assumed that the woman was robbing her. So she asked to check the bags that were full of her personal items and clothing. 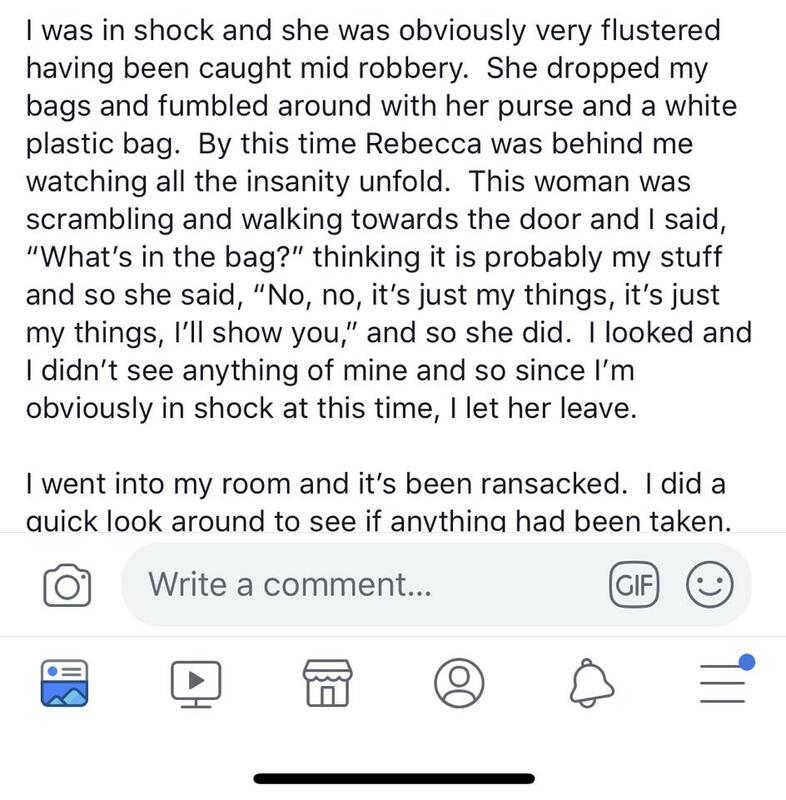 It turns out that yes, the woman was robbing her, but tried to leave the room as quickly as possible without incident. 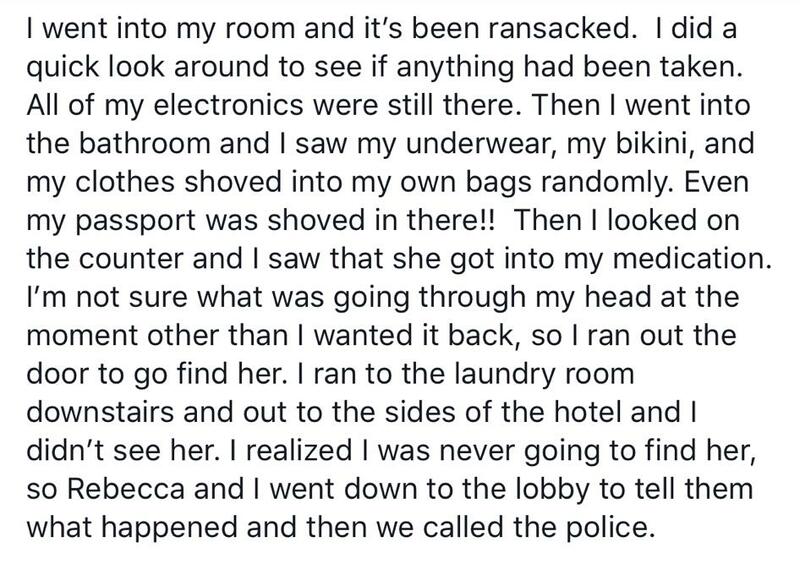 After further investigation, Victoria realized that the woman had run through everything in the place, and was planning on stealing everything Victoria owned, including her medication. She ran down the halls and tried finding the woman, but she was soon gone. 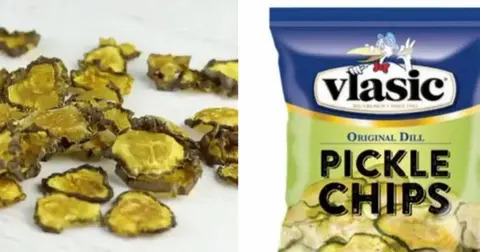 So Victoria called the police. But here's where things get really spooky. 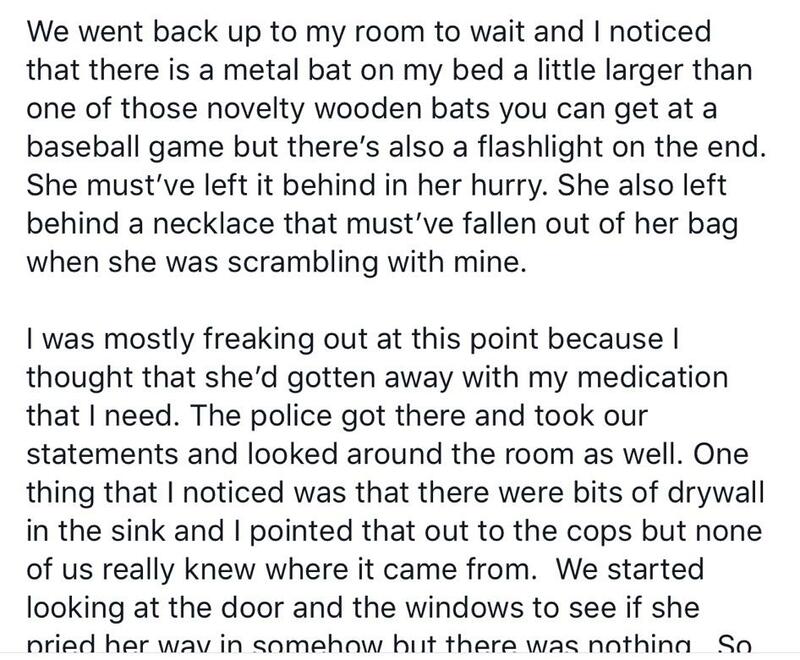 Victoria found a baseball bat and flashlight on her bed, along with a necklace that belonged to the woman. 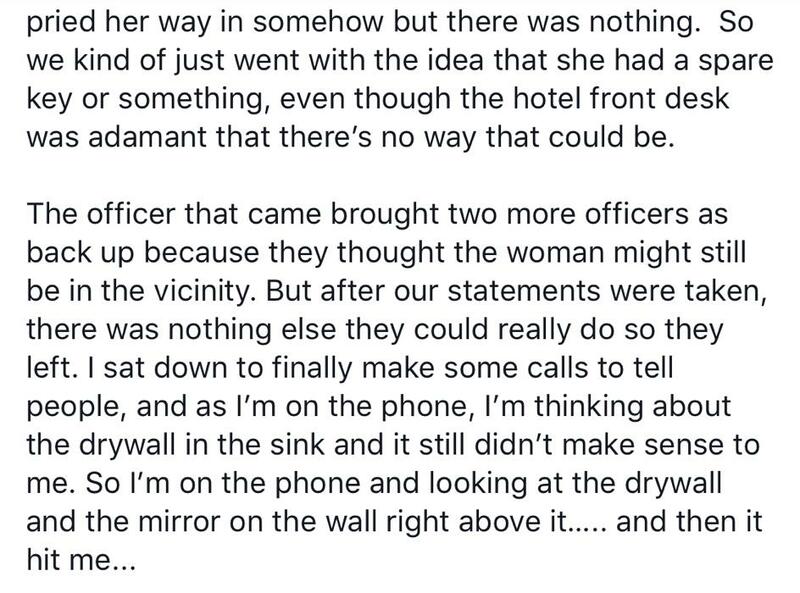 She also saw that there were bits of drywall in the sink, a clue that didn't make sense at the moment. When they looked around the place, they noticed that there were no signs of forced entry. None of the windows were smashed or pried open, so Victoria assumed that the woman had a spare key to the room somehow. That's when it hit her: check behind the mirror. She did, and what Victoria and her friend Rebecca found scared the bejesus out of them. After investigating the hole they discovered that the woman had clawed a hole in the wall of the room and lived in there. This woman was living in the walls and judging by what she left behind, it looked like she had made it a semi-permanent living situation. 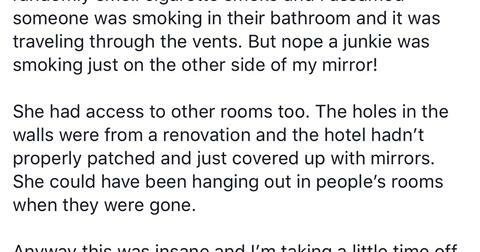 Imagine staying in a hotel room. Sleeping in it. And right behind the wall, someone's sleeping in there, with access to you whenever they want. Yikes. 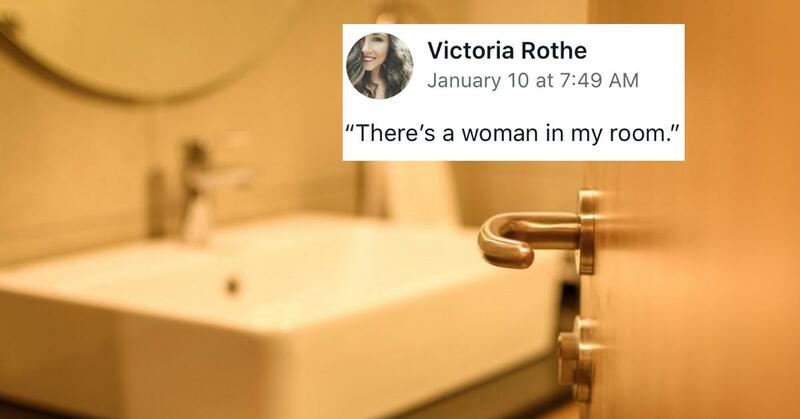 What's even wilder is that she had access to other people's rooms too, so who knows what would've happened if Victoria hadn't walked in on the woman just then. Great, now I'm going to check the walls of every hotel room I stay in from now on. Thanks a lot for sharing this, Victoria.